Tornadoes Rip through Southeastern U.S. In the nation’s worst natural disaster since Hurricane Katrina, thirteen states in the southeastern United States were struck by more than 130 tornadoes on April 27. The number of tornadoes spawned by the spring storm system was among the largest ever seen in United States history. Mississippi, Tennessee, and Alabama took the brunt of the destruction, with the areas around Tuscaloosa and Birmingham, Alabama, being the worst hit. The 24-hour death toll reached at least 340, and estimates of damage are in the billions of dollars. One of the tornadoes that hit the Tuscaloosa area cut a swath a mile wide, one of the biggest tornadoes ever seen in the United States. A few small towns, including Smithville, Mississippi, were almost entirely destroyed. 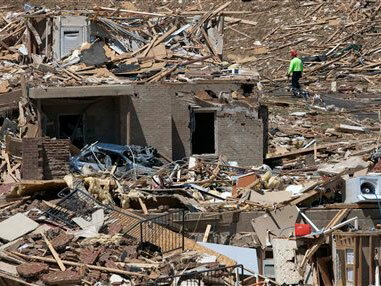 Homes, grocery stores, and gas stations were reduced to rubble. Residents across four states were stranded without electricity, water, or gas. Emergency crews immediately began working to find survivors, treat the injured, and provide supplies to those people in need. President Obama declared huge sections of several states disaster areas. Federal officials visited affected towns to survey the damage and assess what can be done to help to rebuild the thousands of homes and businesses destroyed by the storms. i mean who was involved in the tornado?? I very sorry what happen!!!!!! i so sorry what happen. It’s mid April and just a few days ago, here in South Central Texas we had a High Temp day with 36 degrees.It’s been a ntarsge winter in this neck of the woods. We had a rare ice storm and snow, one like I’ve not witnessed in the 20 years I’ve lived here.I live just southwest of Austin and northwest of San Antonio. We are on the most northern part of what’s called The Gulfstream Air Mass Pattern . That means we often get the humidity and or coastal storms which are somewhat contained in warm air masses.Global Climate Change hasn’t been claimed for this years od weather .well, at least not yet, but who knows? this is horrible!!!! why does mother nature have to be so cruel?!?!?!?!?!?!? Well i lived in Grenada, Ms and it wasn’t that bad actually.. we got a lot of rain but tornadoe wise it was none in sight but my uncle did get flipped by a tornadoe in his 18 wheeler in Canton, Ms.
angelia,do u have to know who was involved ,no. y’all people should go on go.hrw.com and look at that picture and really really look at the pict then comment on it. omg that is terrible but how is that even possible>? Down here in Oklahoma City we had hours of warning prior to the toadrno outbreak in the metro area. The NWS put out a special statement that morning, well before there was any thunderstorm development in the state. Many took heed, and were unharmed though their homes were destroyed. Many businesses and state offices closed early in order to let people get home before the storms hit. In spite of that people died because they ignored the warnings or waited too long to seek refuge. Most of the deaths in our area were due to not respecting the power of nature. What a shame. They just found the body of a 15 month old boy who was ripped from his mother’s arms while hiding in a bathtub in their home. The sad part is their were several storm cellars in here immediate vicinity but for some reason she did not take her family to one of these. This is her second child that has been killed in this storm. Please heed storm warnings. It really is a matter of life and death. Heya! Fantastic posting! I haeppn to be a frequent visitor to your site (alot more like addict ) of your website but yet I love reading information about disaster survival and emergency preparedness. I am only not actually absoluterly certain if it is the right place to ask, but there are no spam comments. I get comments day-to-day. Will you help me? With thanks! We have corrected the date. Oh My Lord. This is very sad. I hope everyone is alright. They are all in my prayers!